This spring, after the wonderful attention died down from the release of the site last December, I came across some incredible data pertaining to the Apollo landing sites that was recently published by the LRO mission team. 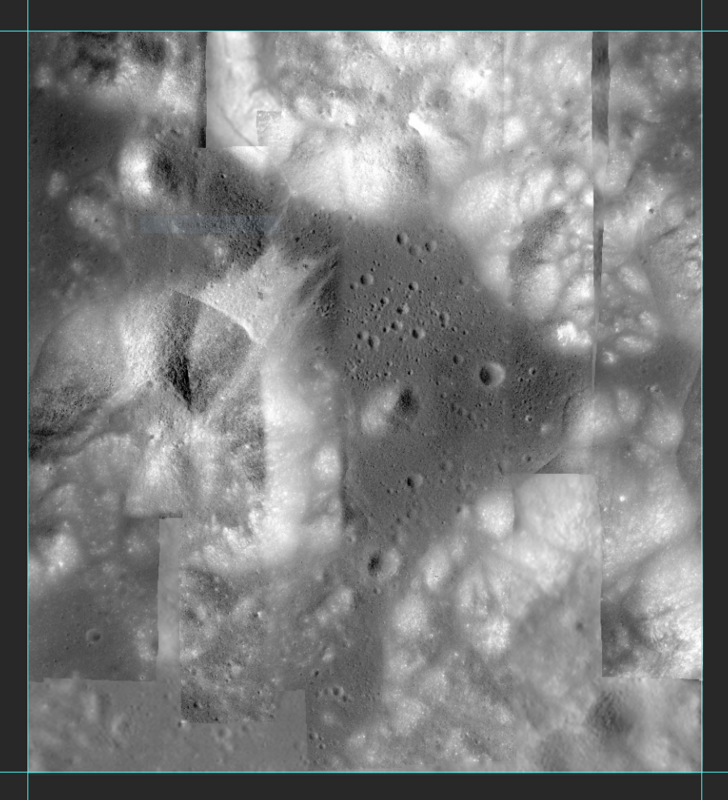 The data includes very high resolution photography and topology data of the valley of Taurus-Littrow, where Apollo 17 landed 44 years ago today. I realized that I could use this data to recreate the landing area in 3D and possibly simulate some of the segments of the Apollo 17 mission that did not include television transmissions. During the three-day stay on the lunar surface the remotely controlled TV camera only transmitted a signal when the Lunar Roving Vehicle (LRV) was stationary (the camera and transmission antenna were both attached to the LRV). When they drove from place to place on the lunar surface (they travelled a total distance of 35.9 km) the high gain television antenna, needed for the video transmission was bouncing around too much to attempt to maintain a transmission to Earth. Because of this, only audio transmissions are available for much of the crew’s time working on the surface. I contacted Dr. Noah Petro, Deputy Project Scientist of the LRO mission at Goddard and asked for his assistance in understanding the data available online. Dr. Petro and his colleagues very generously provided me with even higher resolution data and photography, and were hugely helpful in helping me to better understand how to work with it. I pulled this data into Cinema4D, a piece of professional 3D rendering software, to see if I could create a workable simulation of being in close proximity with the Apollo 17 astronauts as they drove around on the surface. 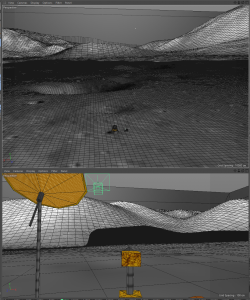 The first step was to displace a 3D mesh using the LRO topology data. 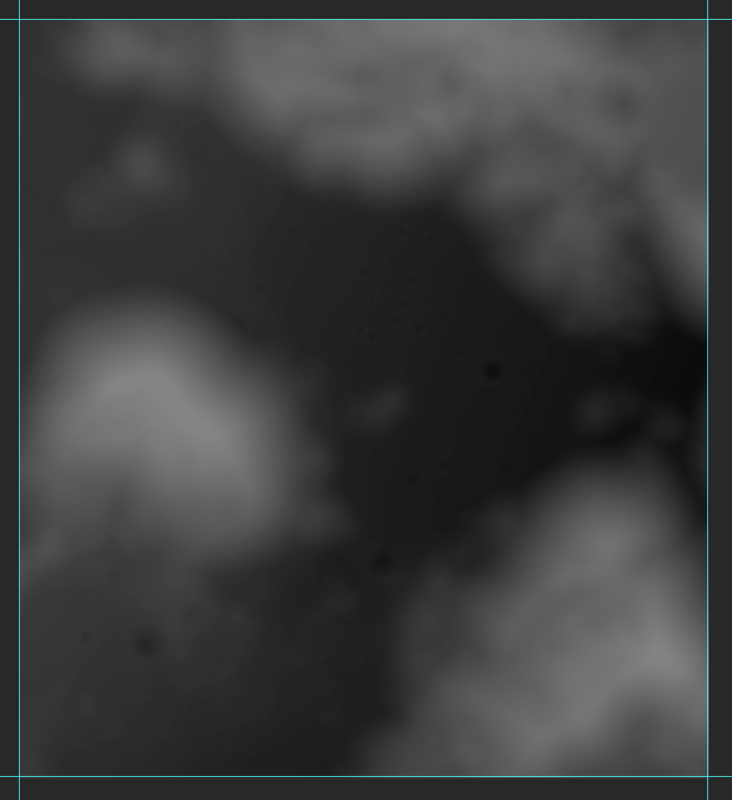 This, in theory, would recreate the texture of the lunar surface, down to individual craters. The image to the left shows one of my first tests. You can see the valley floor and, if you know where to look the landing site of the Lunar Module. I was on to something. The topography data provided to me by Noah and his team is at 16bit resolution–this means that the height of each point on the ground is represented with extreme precision. The next step was to texture the surface using the high-resolution photography taken by the LRO. This would have the added benefit of including real sun shading from lunar surface contained in the photos themselves. 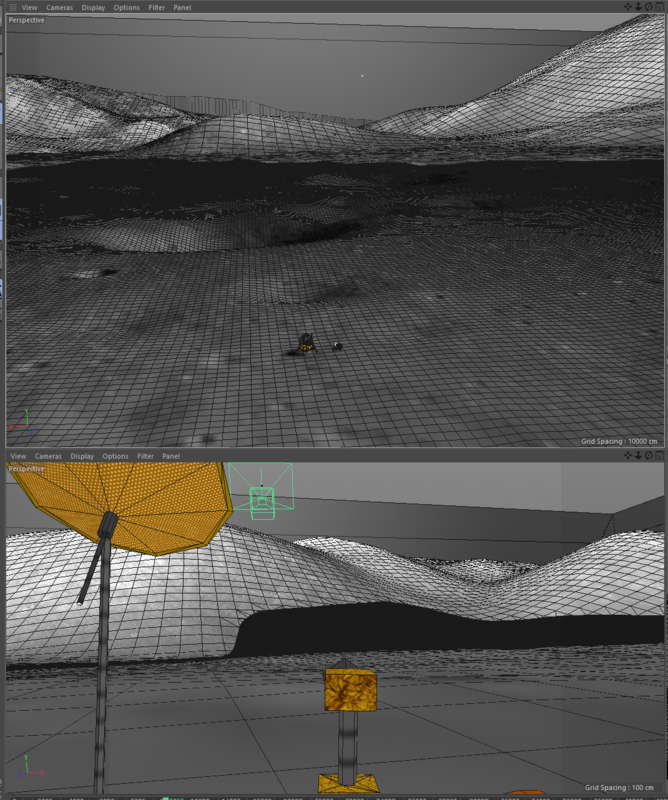 I wouldn’t have to artificially light the artificial 3D scene at all. 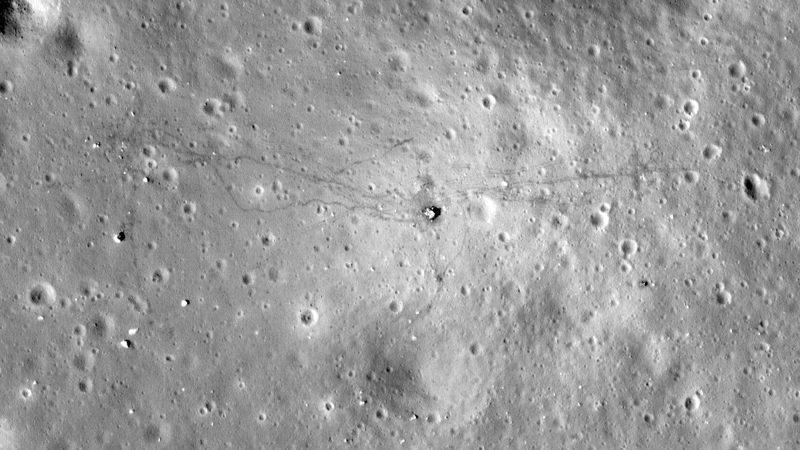 The images captured by the LRO are in such high resolution that you can see the lander and even the footprints left behind by the crews of all of the Apollo missions. The close-up image here shows the Apollo 17 landing site. Note the footprints running east and west from the lander. 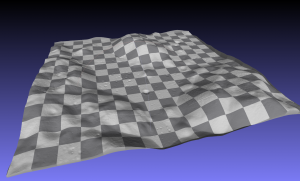 The result of combining the displaced mesh with the photography is a textured mesh that is a replica of the real lunar surface to an accuracy of approximately 60cm per pixel. The dataset is so large (and therefore so accurate) that it requires 64GB of RAM to open the texture file alone. In the left image, you can see the terrain mesh textured with the lunar photography. Here I’m showing the surface mesh lines to illustrate how the data works together to create a realistic reconstruction of the Lunar surface. In the photo you can also see small models of the Lunar Module and the LRV. I found these models online and scaled them appropriately to the image data. In fact, I used the actual tracks on the lunar surface left by the real LRV to verify that I got the scale right! Incredible. To test the accuracy of the result, I placed a virtual camera in 3D space into the LRV at the approximate position of Jack Schmitt’s Hasselblad camera. Schmitt was tasked with taking LRV traverse photos as they drove around on the Moon. Each of these photos has the TV camera that was mounted at the front of the LRV at the bottom center of the frame. For this test I pointed the LRV northeast from the landing site and compared the virtual 3D “photo” with a real mission photo. You can see the same hills in the background at roughly the same scale. 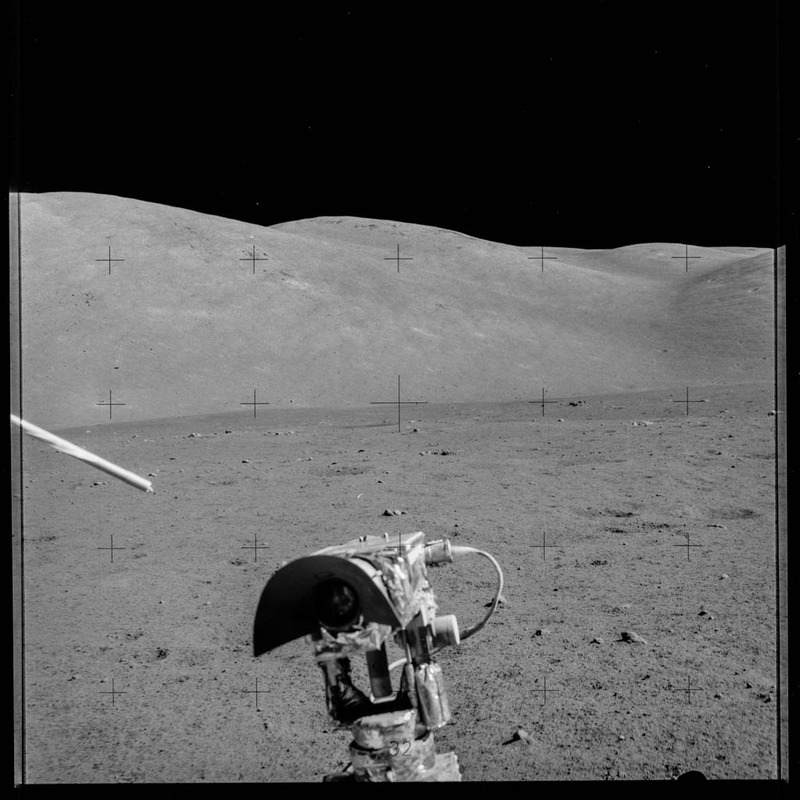 The lighting is different, but that’s because the LRO scanned the area at a time of lunar day that was different than when they visited the valley in 1972. The next step was to understand, in detail where exactly the crew travelled on the lunar surface. Using original post-mission analysis documents from the 70s (left) I roughly plotted out the path followed from station to station. This wasn’t detailed enough to account of every small deviation and turn made by Cernan as he drove. To reach the next level of granular detail I “timed” out the traverses using the transcript and audio recordings I had restored for apollo17.org previously. Here is an example of a timing transcript. This is the first traverse from around the Lunar Module to Station 1. 0:16:26 - 121:52:40 - "you've got another hole on your right here"
0:16:33 - 121:52:47 - "why don't you go left there"
0:17:03 - 121:53:17 - "we need to head south"
This shows that a 30 minute, 35 second video is required and includes all of the movements mentioned by the crew during the traverse. Using this as the basis for a 3D animation, I plotted timing of the LRV’s movement according to this using the 70s mapped course as the basis. This first round of timed movement would show the rover moving at a constant rate from timed event to timed event. The speed of the LRV’s movement is known to have averaged 13 km/h (max 18km/h going down hill). I could error check the timed course animation I created from the raw data by making sure it corroborated the LRV’s actual historical speed. Many errors in course were caught this way and corrected. Further, the photography taken by Schmitt on each traverse could be directly compared to the animated orientation of the rover as the traverse progressed. These snapshots captured not only terrain in front of the rover, but also the orientation of the rover on the surface. Having timed these photos last year, I could use them as a basis for understanding how the LRV zigged and zagged across the surface from station to station. Rendering 3D animation is very very computer intensive work–especially an animation with such high resolution textures and meshes. Cinema 4D has a great feature, the ability to distribute the workload across machines. I borrowed as many computers as I could muster from friends and colleagues. These ranged in capability and age, but every little bit of CPU resources helped. 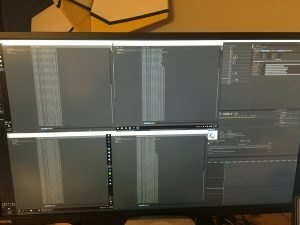 With this make-shift render farm, I heated my basement for about 6 weeks this summer rendering out the animations of each traverse, 14 in all. The resulting animations far exceeded my expectations. The last step was to drop them into the video projects I had used to originally reconstruct the transcripts and re-export them to youtube. This is one of the greatest websites ever made on Apollo. Thank you so much for your effort, I can’t thank you enough. Where did you get all the Apollo 17 Television footage? I’d love to look through the archive on my own accord. Thanks, I’m really glad you’re liking it! Well done and thank you. Apollo17.org is an amazing accomplishment. I have no idea why the NASA Public Affairs Office is unable to do as good a job chronicling human spaceflight as you have done here for Apollo 17. Having everything collected in one place in chronological order makes it so much easier to comprehend. In your answer to the previous post, I find it extraordinary and ridiculous that NASA is seemingly unable to make the TV footage available in its totality. Do you plan to similarly archive other missions? I hope so. I’m glad you like the site. Don’t be too hard on NASA PAO and the NASA History Office. They do a ton of great work. You have to remember that NASA isn’t a museum and it certainly isn’t focused on past missions. They’re focused on future missions. The historical material is mostly housed at JSC and National Archives for safekeeping. Again, they’re not setup for strange requests from outsiders for massive quantities of footage. They also can’t run the old tapes or film through playback machines or scanners lightly. Being careful takes time. Other missions are a possibility. Possibly Apollo 11 next given that the 50th anniversary is in 2019. We’ll see. Thanks for doing all this! Thank you for the great project, I’ve been enjoying it immensely. I’ve been trying to catch the realtime ‘In-Progress’ feed right at the beginning. Would there be a way to calculate when it would restart each time? I’m glad you’re enjoying it. The simulation starts at exactly 9:55:39pm EST on the 6th of each month. If you wait until Dec 6th this year, you’ll be watching the mission exactly 45 years later, to the second. WOW! Thank you so much for providing such a unique way to experience history. I may have to download Orbiter and NASSP again and get that synced on a second monitor, it will no longer be unnaturally quiet! Amazing site – I really enjoy it. However the soundfile seems to be missing from 128:47 to 136:27 – I’m trying to live through the endeavour. But there is a hole in the sound tapestry. Not all of the recordings have been digitized. I have to wait patiently for NASA to get to the missing segments. I developed the Lunar Surfae Design Certeria for the Lunar Rover Design. How do you submit corrections? I am seeing a number of discrepancies between voice and transcript? Amazing site Ben! I wonder how I missed it all those years? I have a little information you might want to add, I have the flown copy of the “CSM Updates” manual from ’17. It has the notes for every SPS burn (mid-course corrections, LOI/DOI/TEIs) for the mission and can be paired with the spoken dialog throughout the flight as the CapCom reads up the numbers. I can send you images of the pages if desired. Thanks Mike. A flown copy of the CSM updates is pretty cool indeed. So you have the pad notes that were taken down by the crew during reading them up? That video refers to the Apollo-Soyuz mission, not Apollo 17. I hadn’t heard that story before, but I’m sure you can find more detailed information about it (with less dramatic music in the background) now that you know the name of the mission. Thanks for your reply! I understand why you didn’t post the comment… not relevant. And — FYI — here’s what I found: However the flight of the last Apollo spacecraft was marred by the fact that the crew almost perished while the capsule was descending under its parachute. A failure in switchology led the automatic landing sequence to be not armed at the same time the reaction control system was still active. When the Apollo hadn’t begun the parachute deployment sequence by 7,000 meters altitude, Brand hit the manual switches for the apex cover and the drogues. The manual deployment of the drogue chutes caused the CM to sway, and the reaction control system thrusters worked vigorously to counteract that motion. When the crew finally armed the automatic ELS 30 seconds later, the thruster action terminated. During that 30 seconds, the cabin was flooded with a mixture of toxic unignited propellants from the thrusters. Prior to drogue deployment, the cabin pressure relief valve had opened automatically, and in addition to drawing in fresh air it also brought in unwanted gases being expelled from the roll thrusters located about 0.6 meter from the relief valve. Brand manually deployed the main parachutes at about 2,700 meters despite the gas fumes in the cabin. By the time of splashdown, the crew was nearly unconscious from the fumes, Stafford managed to get an oxygen mask over Brand’s face. He then began to come around. When the command module was upright in the water, Stafford opened the vent valve, and with the in-rush of air the remaining fumes disappeared. The crew ended up with a two-week hospital stay in Honolulu.